Our vision of the tumultuous history of Europe in the 15th and 16th centuries has become inseparable from the flourishing of Renaissance art, particularly the outpouring from such Italian masters as Leonardo da Vinci, Michelangelo, and Sandro Botticelli. Somewhat lesser celebrated are artists working in more northern climes, such as Jan van Eyck, Pieter Bruegel the Elder, and Hieronymus Bosch, the bizarrely inspired Netherlandish draughtsmen and painter. 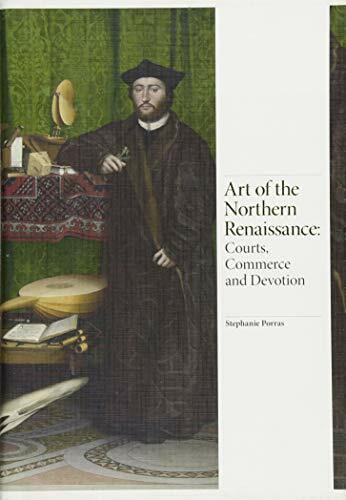 In Art of the Northern Renaissance: Courts, Commerce and Devotion, Stephanie Porras offers a captivating series of essays that take the reader inside the art and behind the stories of painters, sculptors, printers, metalworkers, and tapestry artists working in northern Europe from 1400 to 1570. Porras, an assistant professor of art history at Tulane University, uses these artists as a means to appreciate not just the art, but the explosion of economic activity, religious conflict, and social unrest that gripped Flanders, Brabant, Holland, and the larger Holy Roman Empire during this pivotal period in the story of Western civilization. Devotional art in the Roman Catholic tradition was in some ways the coin of this realm. Likewise, the newly discovered art of printing was a tool in rising Protestant reaction to the corruption and exploitation perpetrated by various monarchs, pontiffs, emperors, and feudal lords. Porras ends her period of study in the 1560s because it was in 1563 that the Roman Catholic Church issued its decrees on art at the Council of Trent, a summit conference called in response to the Protestant critiques of devotional art, saintly worship, and abuses of papal power. Those edits sparked the church’s vicious Counter-Reformation, including armed invasions by the northern arm of the Spanish inquisition, heresy trials, and the iconoclastic riots by mobs that erupted in the Low Countries in 1566, prompting one of the largest refugee crises of the Protestant Reformation. Art was also a big part of the story of the rise of urbanization and capitalism in this chapter of European history. The new art of printing, both popular art reproduced via woodcuts and religious tracts churned out on newly invented presses, are a big part of the story. Of course, printing also put the Bible in the hands of the masses for the first time, allowing scriptural interpretations that challenged those of the Catholic church. Martin Luther’s momentous 1517 publication, the Disputation of the Power of Indulgences (also known as the Ninety-Five Theses) helped spark the Protestant Reformation and such extended conflicts as the French Wars of Religion, the Thirty Years’ War in central Europe, and the Dutch Eighty Years’ War. Among the 135 illustrations in this beautiful hardcover edition are woodcut and letterpress prints designed to both canonize and demonize Martin Luther. The 1521 woodcut by Hans Balding Grien, titled “Martin Luther as an Augustinian Monk with the Holy Spirit,” served as a frontispiece for a reformist tract. It depicts the German cleric against a halo of saintly energy, ironically transforming him into a Protestant icon. On the opposing page, Porras contrasts this image with 1529 woodcut and letterpress tract by Hans Brosamer, which envisions Luther as the seven-headed devil in the apocalyptic Book of Revelation. Porras’ concluding essay begins with the events of August 20, 1566, when a mob of Calvinist iconoclasts broke into Antwerp’s cathedral, smashing altarpieces and removing statues. Such riots across the Low Countries that summer prompted Phillip II to send in Spanish troops to put down the riots, prompting the decades-long Netherlandish revolt against the Holy Roman Empire. Don Lattin is the author of two books of narrative nonfiction, Harvard Psychedelic Club and Jesus Freaks.